Double Crown Books is delighted to announce the publication of its second book in its 'The Posters of...' series - a collection of books dedicated to showcasing historic illustrative artwork in entertainment advertising - 'The Posters of Billy Smart's Circus'. 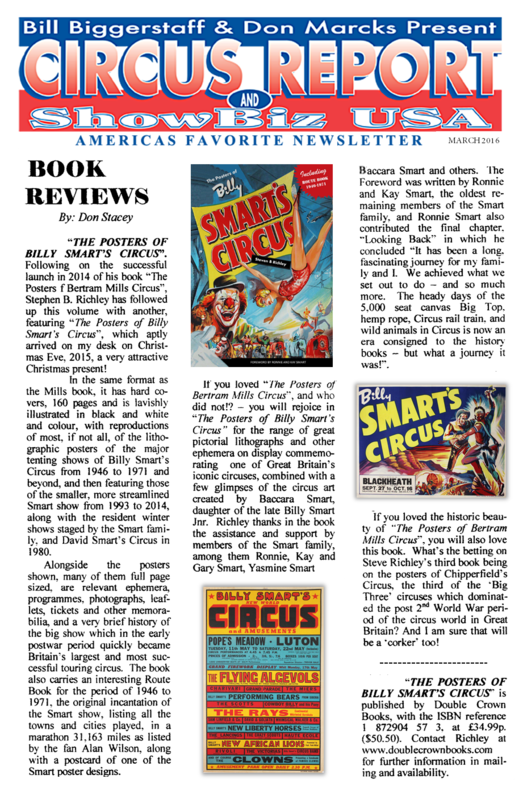 Billy Smart’s Circus had a meteoric rise in fame and fortune starting in 1946. The show was particularly amazing in the short amount of time it took to increase in size, stature and quality. In less than 10 years, Billy Smart’s Circus was touring the country in a 4-pole, 200ft diameter 6,000 seater big top “Europe’s Largest” with 100 performers and 200 animals. It toured for 25 years, discontinuing it’s national tenting tours under the big top in 1971. 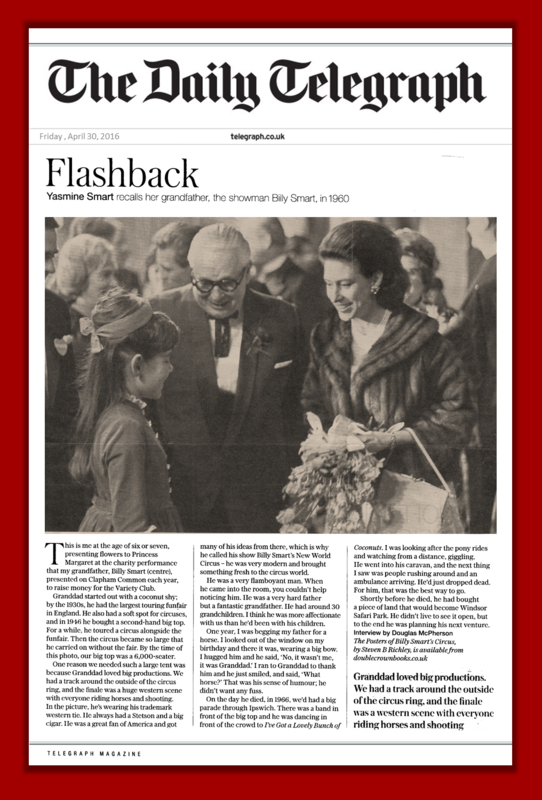 Billy Smart’s Circus continued to produced top class television shows from its winter quarters in Windsor until 1982 and the tenting show was subsequently revived by the Smart family in a modern format style in 1994. 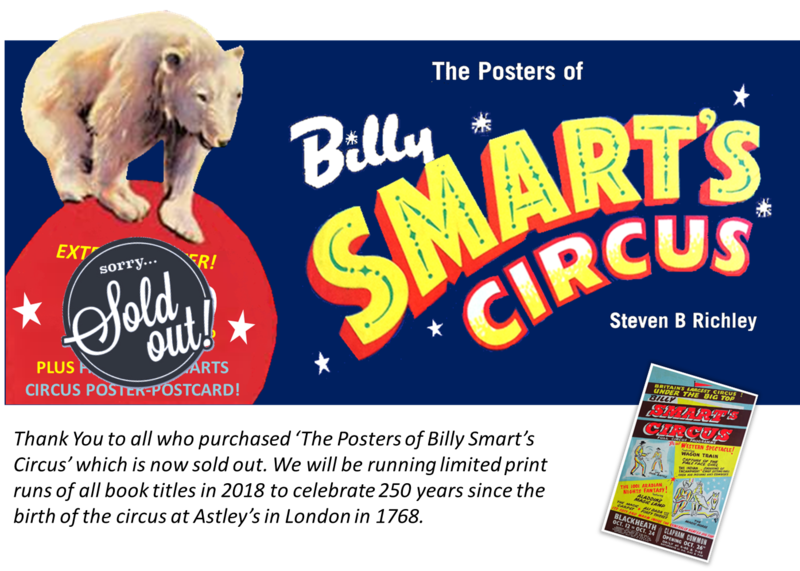 'The Posters of Billy Smart's Circus' features over 150 original posters - from the first year Smart's Circus went on the road with the family's fun fair in 1946 to the last tour of the UK in 2014. Produced with the co-operation of the Smart family, the book features exclusive material from their private collections and a number of pieces written by them about their experiences with this flamboyant and colourful show that brought the influences of the 'New World' to the British public. Photographs, costumes, handbills, invitations, tickets and all of the programme cover designs accompany the posters and anecdotes to tell the kalidescopic story of the great Billy Smart's Circus.